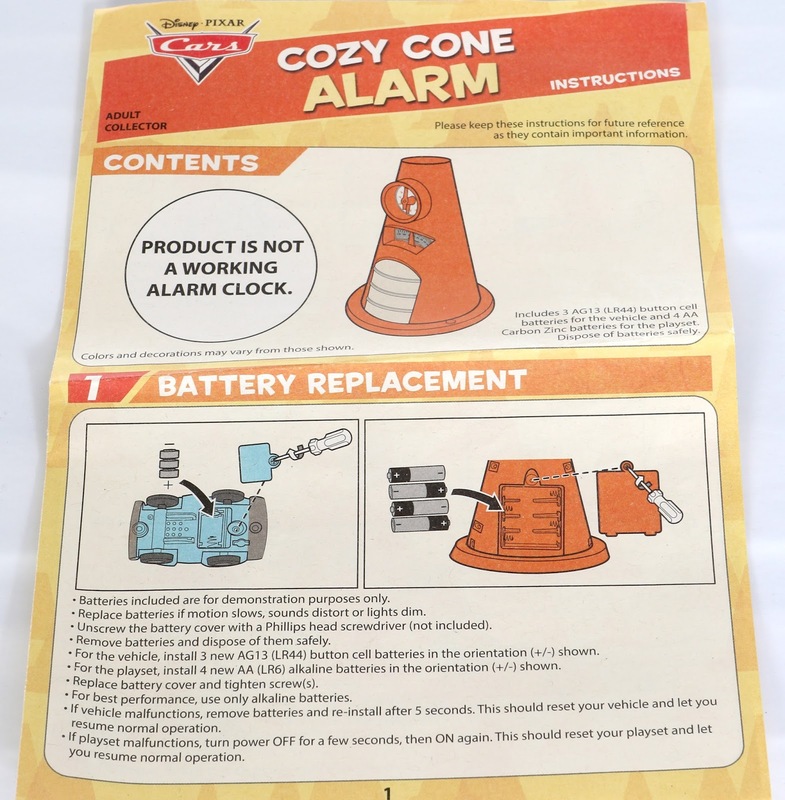 A few days ago I posted my quick video review of this amazing new Cars Cozy Cone Alarm clock replica featuring my initial unboxing and reaction. Today I wanted to go even more in depth with my additional thoughts on this awesome product. Let's get right to it! 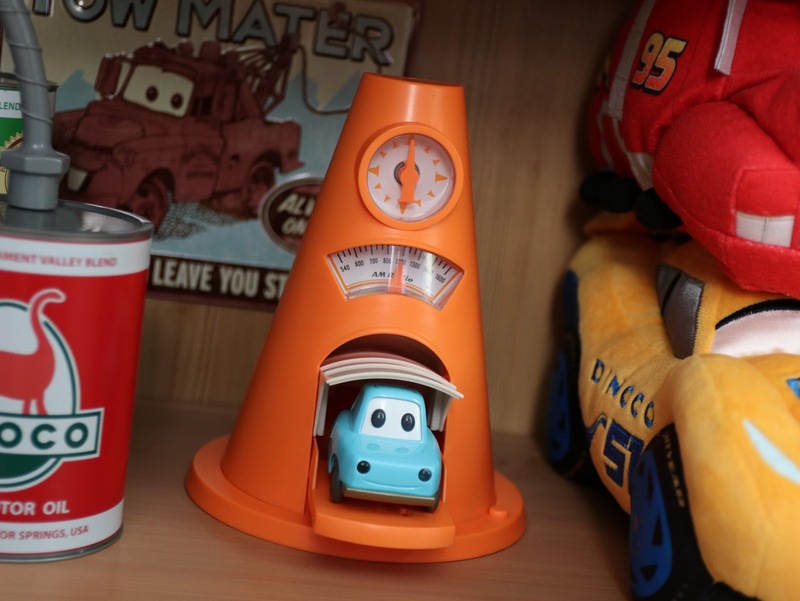 I love it when full scale props based on items from Pixar films get made in real life for collectors like myself to purchase (examples: Carl's grape soda badge, the Pison Cup trophy, Mike's MU hat, the blue umbrella, etc.). 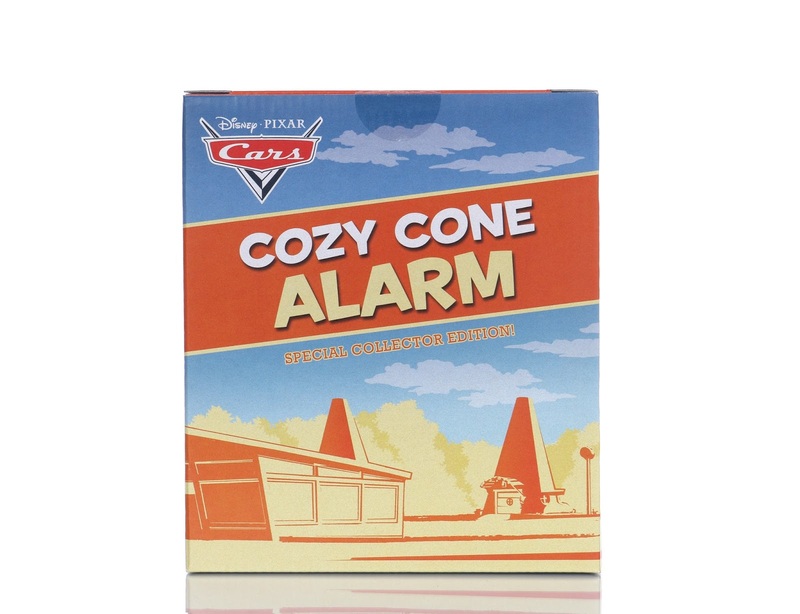 For years, I actually hoped that a Cozy Cone style alarm clock from Cars would be made in this vain, especially after they teased us with it at Cars Land (seen in my pic HERE; this is looking through the back window of the Cozy Cone Motel). 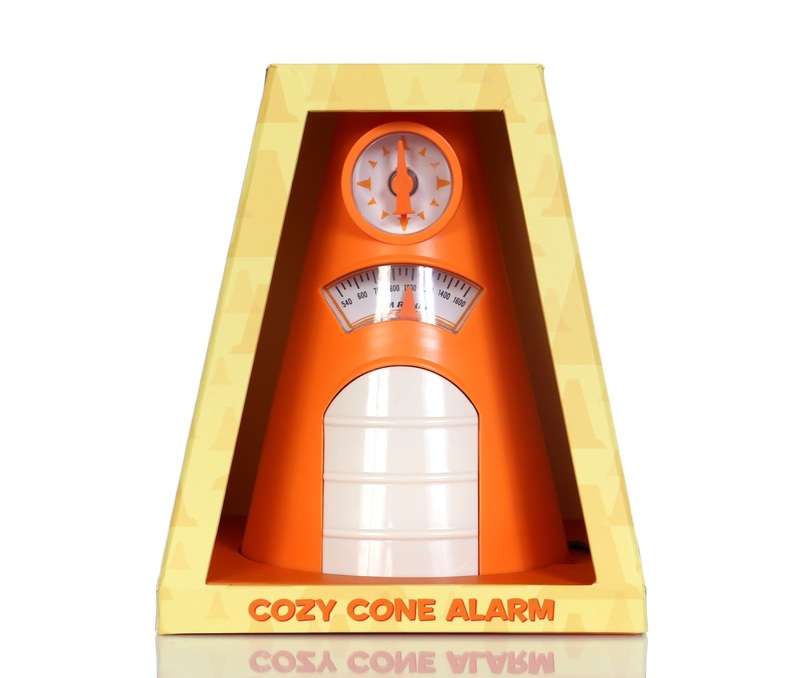 Well, a couple weeks ago I got my wish as the Cozy Cone alarm replica I hoped for was finally released— a D23 Expo 2017 exclusive! This was released by Mattel (at their official booth on the expo show floor) during the weekend of July 14-16. Limited quantities were produced (LE of 3000) and retail was $50. 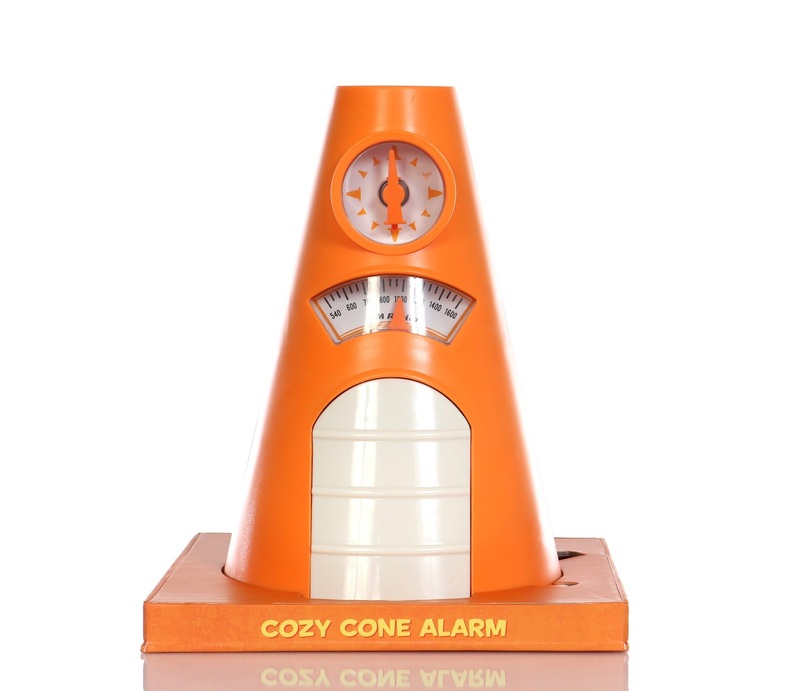 It should be noted right off the bat that, though this does have lights, sounds and other electronic features, this is NOT an actual working alarm clock or AM radio. This doesn't bother me in the slightest, but I know many people were disappointed by that aspect. Mattel always does an amazing job with their packaging, especially for their expo/convention exclusive "adult collector" items. Before we unbox this thing, I wanted to give you a detailed look at this fantastic retro inspired box from all angles. 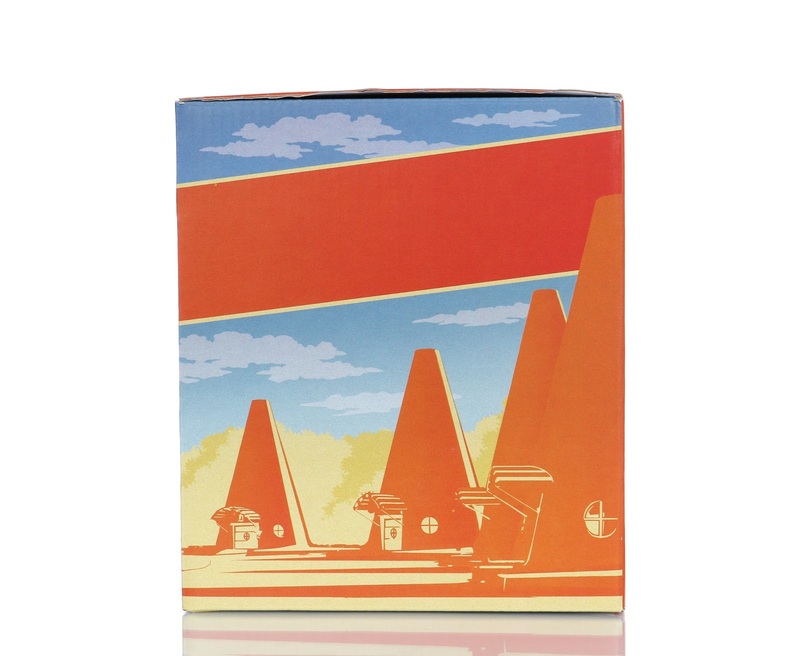 The packaging alone is a collector's item in itself! I will not be throwing this away. 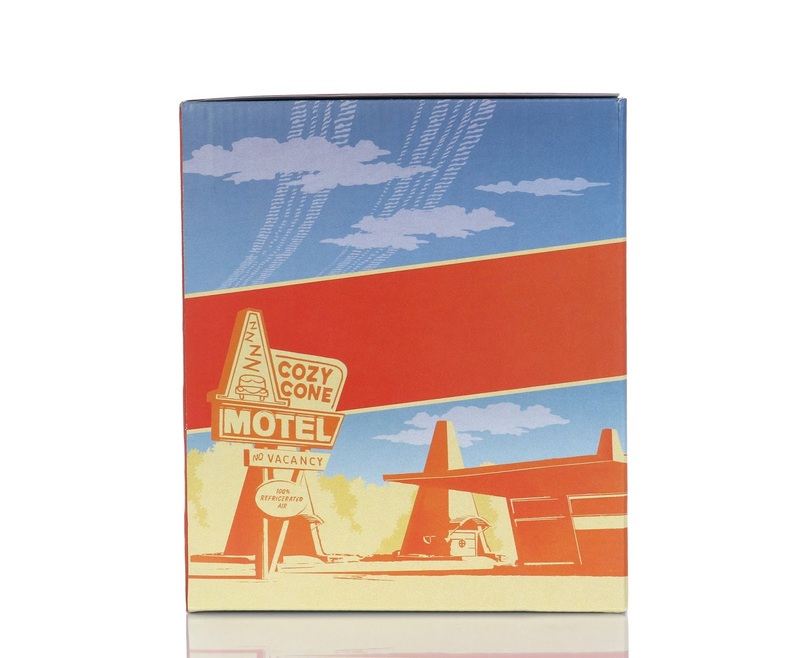 Once opened up, you'll notice that the Cozy Cone Alarm itself is housed in yet another cute minimal style box within the main box. This is pretty standard for Mattel, since they often do packaging within packaging when it comes to their collector's items. 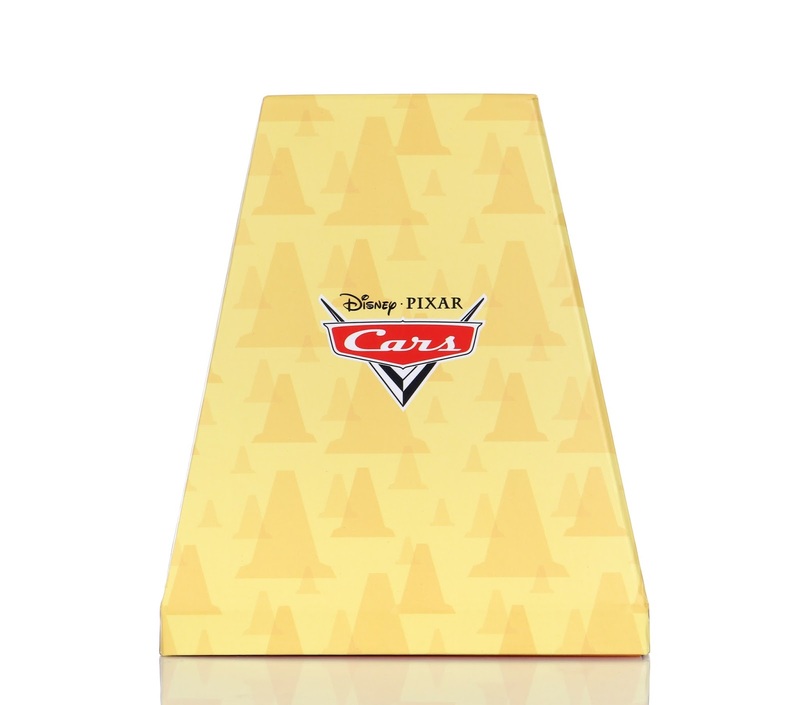 The yellow cone shaped box slips right off and—that's right. More packaging! 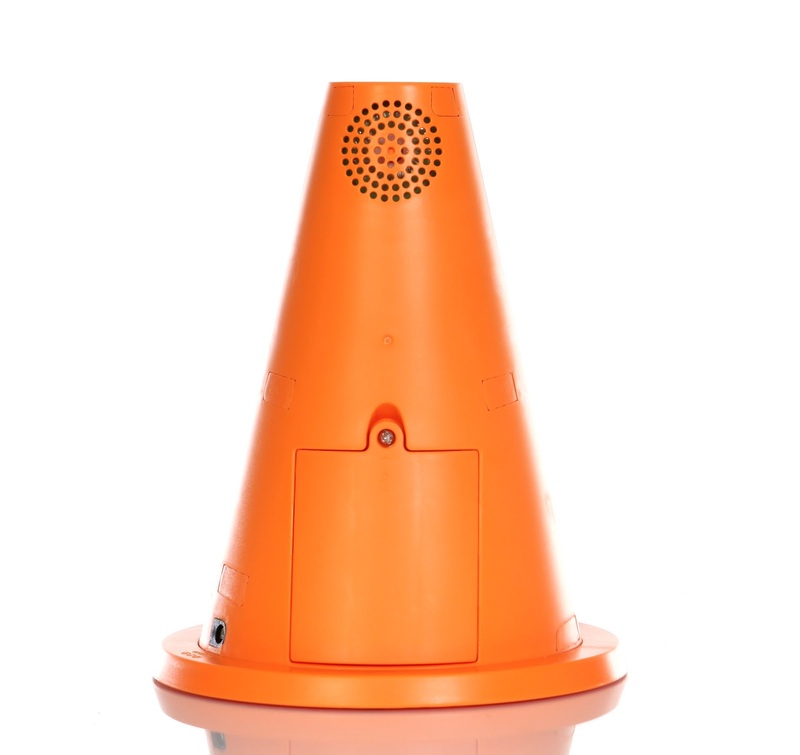 You then have to detach two simple key locks on the underside of the cone in order to remove the bottom orange cardboard piece seen below. 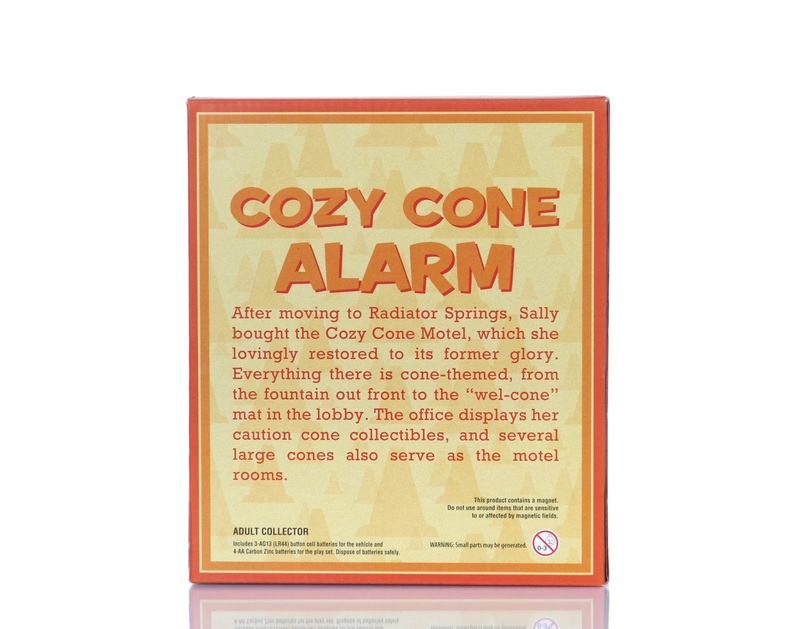 Now that it's finally out and free of all that cardboard, you're ready to see this Cozy Cone Alarm in action! What's nice is that the batteries are included and already installed, so you don't have to worry about that (for future reference though, four AA batteries are required for the alarm and three LR44 button cell batteries are needed for the car inside). Make sure the ON/OFF switch (found underneath the alarm) is turned to the normal mode and then press the activation button on the side of the base to start the fun. 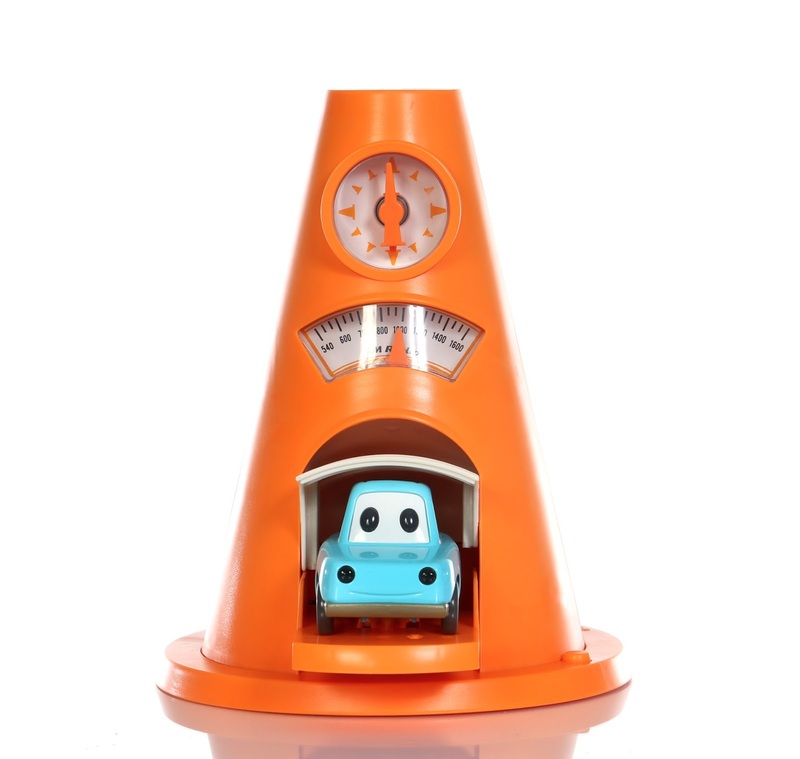 The little alarm car will pop out and in several times while beeping (with the same sound effects it has in the film and even adds working headlights); then the "AM radio" will start automatically "tuning" to different "stations" while country rock music plays and the upper areas glow (three brief music tracks are heard per press and are not always the same or in the same order). 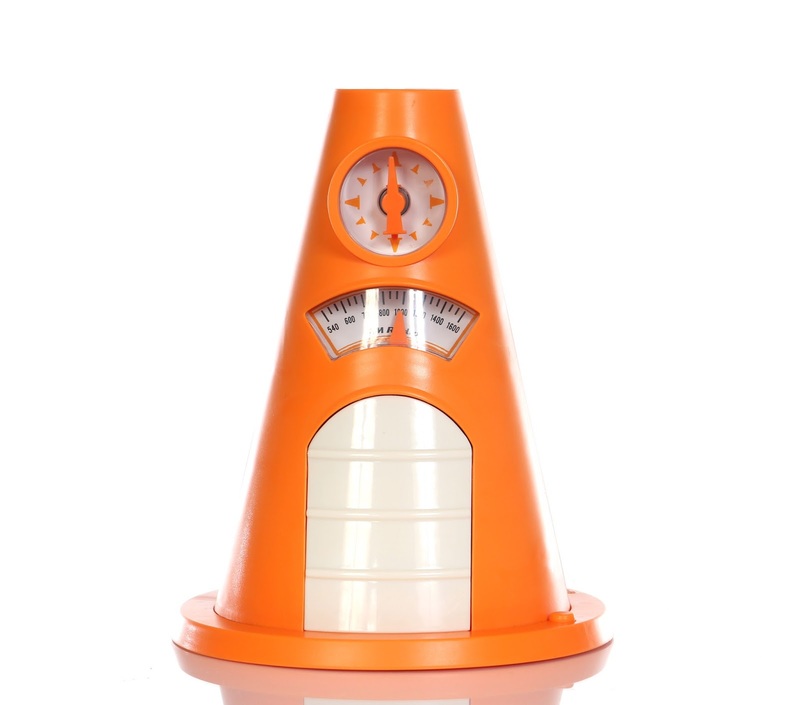 Note: The actual alarm clock dimensions are 8 1/4" tall x 6" wide (at base). On the back of the alarm you can see the speaker, the main battery compartment and an AC adapter port (for if you'd like to keep it plugged in and not use the batteries—AC adapter not included). Plugging it in is especially useful if you want to take advantage of the light sensor setting. 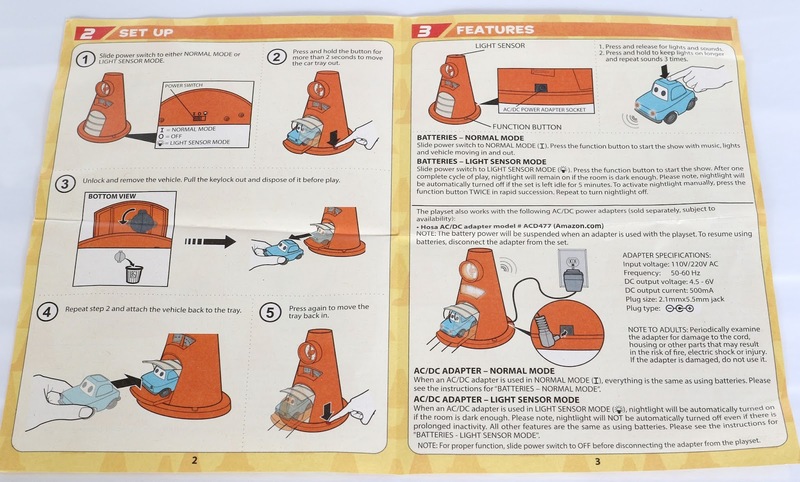 When switched to light sensor mode, the sensor (found on the top of the cone) will trigger a continuous night light when it senses a certain level of darkness. By the way, something I didn't mention in my video review is that the alarm car is removable. Just hold down the main activation button for a few moments and the car/tray will pop out and remain out for a solid 45 seconds or so. To take the car out, you'll first need to remove another little key lock under the car's tray. After that's disposed of, just give the car a good tug [straight out] to remove it from within the cone. The car is actually diecast metal with rubber tires and rolling wheels, which are some quality touches. Press the button on its top for lights and beeping sounds (press and hold the button for a longer show). Putting the car back in is easy—just slide him back into the tray the same way you took him out. It'll snap right back into place. 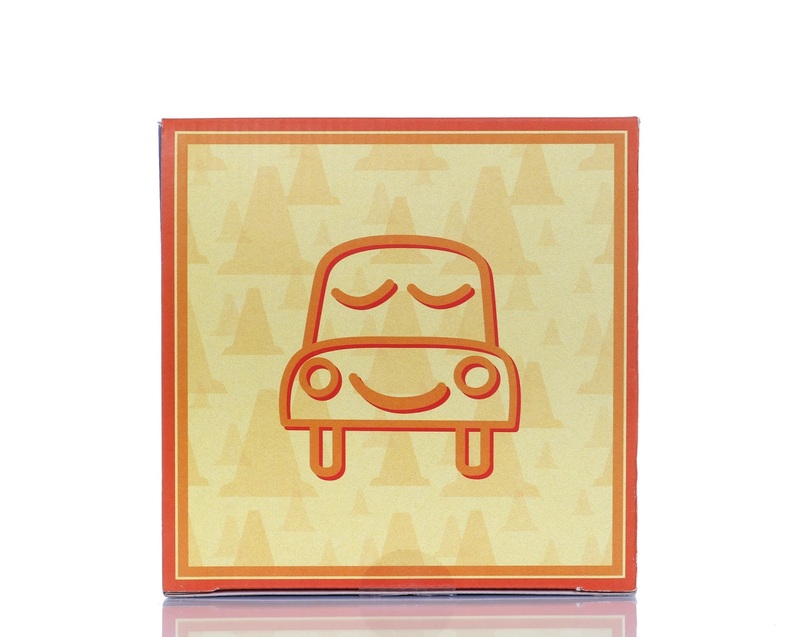 If you want to display the alarm with the car sticking out at all times (like I do—as seen on my shelf below), hold the activation button down for those few seconds (as mentioned above), but this time turn the battery power off after the tray comes out. It looks so great displayed this way! Though I covered just about everything you need to know about this above, here are the instructions if you ever need to refer to them on here. 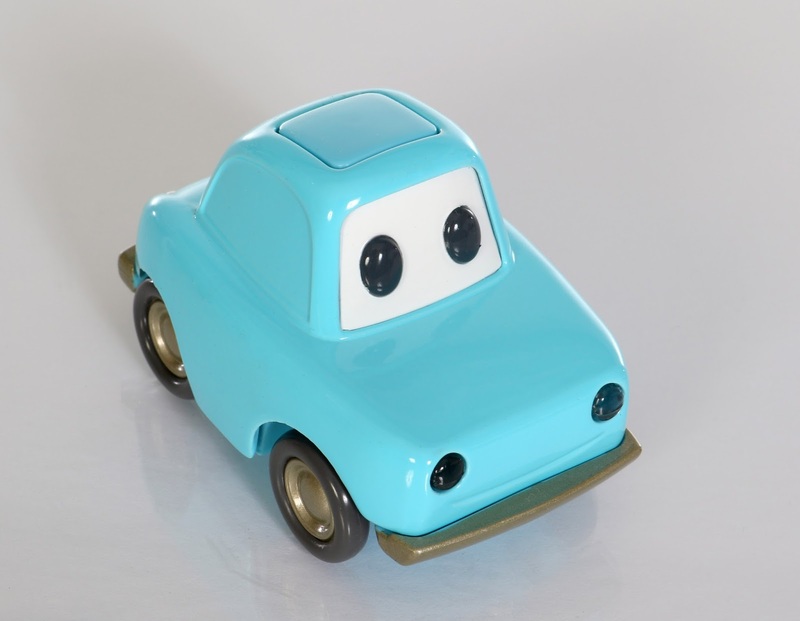 I'd say that this is absolutely a must have for any serious Disney·Pixar Cars fan/ collector. I LOVE it! A huge thanks to my friend Paulina who helped me get this since I wasn't able to attend the D23 Expo this year. I can't thank her enough! For those of you interested in purchasing this, eBay is your best bet at this point (and don't worry—prices are surprisingly still pretty reasonable). Be sure to visit this direct link to current listings HERE. If you missed it, check out the alarm in action in my YouTube video below! You won't wanna miss it. As usual, feel free to like, subscribe and share!